The Power Rangers Legacy die-cast Super Zeo Gems set is an essential addition to any Power Rangers collection! A pretty solid description for items shown only once in Power Rangers Zeo! Either way it is nice to see the Legacy line of Power Rangers continue to tread past the days of Mighty Morphin. Check out the listing on Amazon by clicking here. There is no release date or price at this time. For those unfamiliar with the item – when Trey of Triforia passed the Gold Ranger powers to Jason, he left the Power Rangers Zeo with a gift – the Super Zeo Gems! Zordon had assumed they were lost forever (and that was the end of their lore) and was excited that they were back. Jason, using the Golden Power Staff, was able to reactivate the Super Zeo Gems to activate the brand new Super Zeo Zords which would combine to form the Super Zeo Megazord. 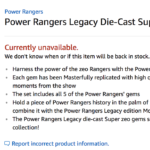 If the Power Rangers Zeo Legacy Super Zeo Gems comes to be will it be joining your collection? Sound off in our discussion thread! London Toy Fair 2018 has concluded for the day! But more pictures of the Bandai UK booth have been posted online courtesy Instagram user @SimplePeetDoodles. 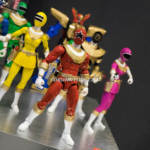 Check out some more up close pictures of the upcoming Legacy 6.5″ Psycho Rangers as well as the Legacy Zeo Golden Power Staff, Legacy Mastadon Zord, upcoming Power Rangers Zeo and Power Rangers Dino Thunder 6.5″ Legacy figures, and some Pop-Up Power Rangers based on Mighty Morphin Power Rangers. If any more images show up online we’ll share them with you. Join in our discussion on the forums! Which items are you excited for? Which ones are you NOT excited for? Sound off! 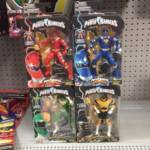 The next series of Legacy Power Rangers 6.5″ Figures have been spotted and purchased at a Wal-Mart in California. Dino Thunder Red Ranger, Dino Thunder Blue Ranger, Zeo Green Ranger, and Zeo Gold Ranger were spotted and purchased which has given a sigh of relief to collectors who thought the metallic wave of Mighty Morphin Power Rangers Legacy figures had pushed back the release of these highly anticipated figures. Sadly, there’s been a large fan backlash against Bandai America for the quality of this wave of figures. If you look closely at the pictures, you will see a majority of the “gold” pieces, including the entire armor of the Zeo Gold Ranger, have been unpainted and instead are the flat, matte gold which looks more orange than gold. The same plastic can be seen as the holster for the Dino Thunder figures as well as the Build a Megazord pieces of the Zeo Megazord. We reached out to Saban Brands for a comment but they have not responded at the time of this article. We will keep you updated with any info that comes across. Our site sponsor BigBadToyStore.com has sent out their newsletter with some exciting update for our Power Rangers fans. Coming soon are brand new Legacy items – the Legacy Green Ranger helmet, the Legacy Zeonizer, and the Legacy Golden Power Staff! Check out the pre-order links below. Be sure to check out the full newsletter below by clicking “Read More”. Check out our site sponsor BigBadToyStore.com today! Revealed at this year’s San Diego Comic Con was the Power Rangers Zeo Legacy Zeonizer. Now, thanks to a listing at EntertainmentEarth.com, we have an official press image as well as the release details. 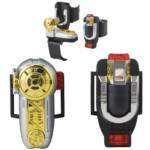 Due out in February 2018 for roughly $99, the Power Rangers Zeo Legacy Zeonizer official image gives us our first clear look at how beautiful this item is. Undoubtedly this will be a hot item that will be in the collection of many fans. Easily the most anticipated part of the Legacy 6.5″ Figure line is the release of the Power Rangers Zeo figures. On display at Toy Fair 2017 was the entire assortment of Power Rangers Zeo including the Build a Megazord figure, the Zeo Megazord. Check it out – Toy Fair 2017 – Legacy Power Rangers Zeo 6.5″ Figures – by clicking the title of the story! The hits just keep coming with another new reveal from Bandai America’s panel at Power Morphicon! The convention is still over half a year away and more guests are planned to be announced. It’s worth noting that, as always, life happens and sometimes guests have to cancel. We’ll keep you up to date in the meantime. If you’re planning to attend this year’s Official Power Morphicon – let us know in the discussion thread! We’ll be there and look forward to celebrating all that is Power Rangers with you! New Ranger Key Packs Found at Toys R Us! After months of speculation on whether these would even be released, cryptic answers from Bandai of America, and more than one of these packs showing up on sites like TaoBao, most of the remaining Power Rangers Super Megaforce Ranger Key packs have FINALLY hit retail! And it looks like the new keys packs are indeed Toys R Us exclusives! 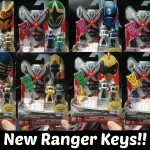 Twitter user @clong83[/URL] found these 8 new Ranger Key Packs at the Willow Grove, PA Toys R Us location! They do feature the TRU exclusive sticker so that narrows your search area to find these as most retailers begin to switch over to Dino Charge product fro the winter/spring. The hunt is on! Head to your local Toys R Us today to see if you can find these Legendary Ranger Keys! UK Mighty Morphin Power Con announces guests! It’s been a very long time coming but in 2015 UK Power Rangers fans will be spoilt for choice with the official announcement of a SECOND Power Rangers convention. Previously revealed during the London Film & Comic Con last month, Mighty Morphin Power Con will take place on Friday 20th to Sunday 22nd February at the Hilton Birmingham Metropole. Full ticket information is available on the official website, but in the meantime fans can join in the discussion at our dedicated thread in the Conventions & Get Togethers section of the boards!